Our Little Inspirations: Here Comes the Bunny! I cannot believe Easter is just a week away and it really sneaked up on us after this extended cold winter. Speaking of winter, we're apparently getting another round of snow on Tuesday, so I hope the Easter bunny has an extra layer of fur to keep warm this year! Spring just hasn't come around here yet and we'll probably go directly into a hot, steamy summer once this cold goes away. I made this fun card with a PTI stamp set in colors of turquoise and white with a little pop of green done with a SNSS grass die, and a snippet of checked paper that matched. I die cut the panels with a Lil Inker stitched rectangles set, and lastly added a little ball of cotton for his tail. I thought this little guy was so cute, I decided to make one in my favorite color combination of purple and green! Since I make cards for hospitalized kids, I made a few more to send to them! This cute PTI stamp set was part of a prize I won back in Darnell's first NBUS challenge, and this is the first time I've used it to make cards, so I'm entering these cards into her NBUS#4! She's reached 800 followers, isn't that incredible? Soon we'll all have to put together an "Acraftamy Awards Show" to honor her accomplishments! More snow on Tuesday? What???? I didn't even look at the future forecast yet since we got home. We stayed in PA Friday night and started out early yesterday morning for the last part of our trip home. We woke up to snow and it snowed and sleeted most of our way home. Then last night we got another dusting. Anyway to the important matter at hand: These precious cards. They are so darling and I love all of them, but because your favorite colors and mine are the same I have to favor the purple and green one. The cotton ball is so fabulous. The "kids" will get the biggest kick out of these. Fun, fun, fun. Have a delightful Sunday. Carol these are just awesome!! Love all the colours and OMG the fluffy tails!! These cute bunnies are adorable in any color! I agree that we need to do something to honor Darnell! Ca-ute! They def remained me of spring. Oh NO! I didn't hear about the SNOW (four letter word!!!) forecast! Although, I'm not entirely surprised...I remember many years where we still had snow in Easter. Speaking of Easter...your cards are really cute! I like how you added the cute little tail, and made them in all those yummy colors. Carol, May I post your card to my blog? Oh how totally adorable Carol!! I just love these cuties! I did giggle about the possible ruination of a couple of punches on acetate trying to make a mask - guess who almost did the same AND came close to wrecking her Cuttlebug when she resorted to dies!! None of them really worked properly anyhow which is why I resorted buying the mask :) Good luck in the draw! Your bunny cards are adorable!!! Love the cute tails with cotton! The purple cad is also my preferred! Sweet easter cards! 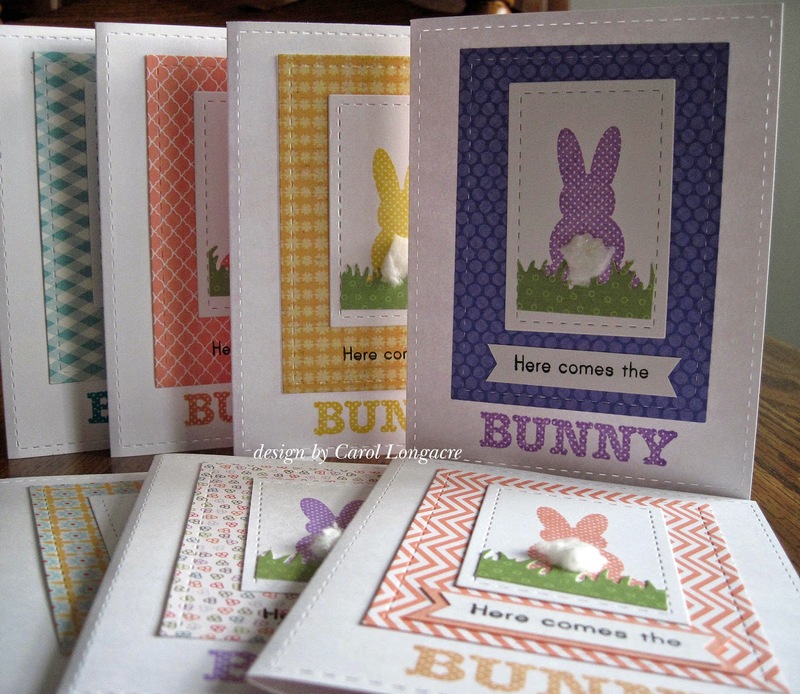 This is a gorgeous set of cards, I love the cute bunny with his cotton ball tail. The papers you used are all so pretty too. Oh my goodness Carol, just how often do you create? I can't get over here fast enough it seems. You are really on top of things. Those Easter cards are absolutely darling. The kids will love them. I didn't make a single one this year and I think it is too late to start. Gosh Carol., these are so darn cute! 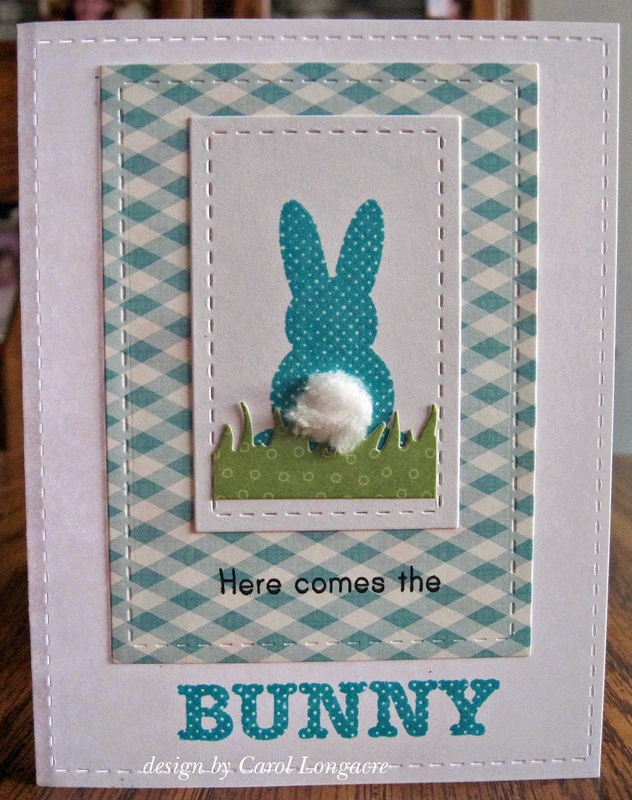 Love that sweet bunny silhouette and those stitched dies are fab! So many fabulous bunny bottoms! Great assortment of colors and patterns. Oh, these cottontails are just adorable. Great colors and so fun. They are sure to be loved. What a cutie with his fluffy tail! 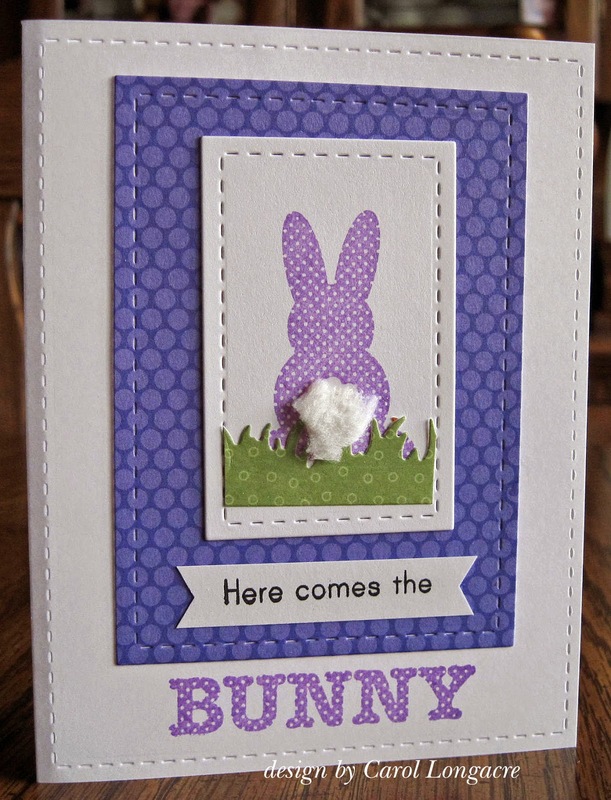 Sweet cards in great Easter colors. OMGosh these are so adorable, I love them. I caught sight of these over at NBUS. They are darling! I love the gingham look to them and their fluffy tails.